I wonder if I am the only person who ever has days like this? As I sat today observing my good colleagues Mary and Jayashree working with students I was in awe of their knowledge and enthusiasm. Furthermore I was stunned by the quality of information and the depth of perception coming from our students. Why, I asked myself, does it seem that everyone in this room is far cleverer than me? 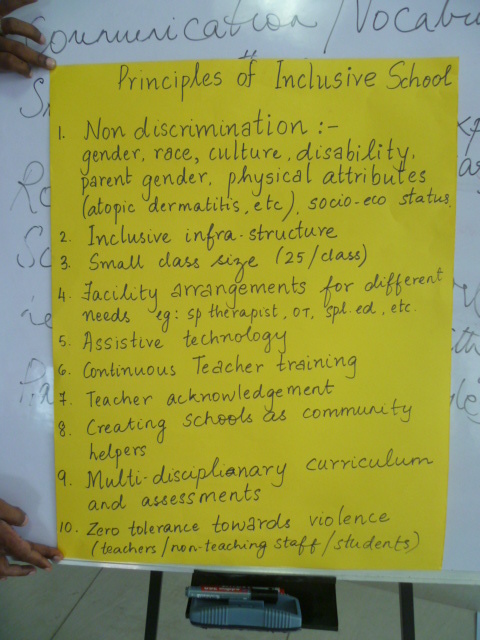 Today’s topic was assessment in inclusive classrooms, an area guaranteed to provoke strong feelings and one which we hoped our course participants would debate with vigour. We were not disappointed. Indeed their thoughtful critical responses indicated the many frustrations and challenges that they experience with regards to assessment in their professional lives. Semantics are important and this is apparent whenever issues of the assessment of learners are discussed. Assessment for learning, or assessment of learning? Assessment of the pupil or assessment by the pupil? So many complexities to explore and no wonder that this is a subject that gets teachers so animated. Writers such as Dylan Wiliam and my colleague Knut Roar Engh have emphasised the holistic nature of effective assessment and have encouraged teachers to see this as an embedded part of the teaching process rather than an addendum to the main activity. Yet it would appear that many schools still place an emphasis upon assessment as a summative process with little regard for how it may shape teaching and celebrate the accomplishments of pupils. Inclusion is essentially a democratic process that recognises the rights of individuals and marginalised groups and celebrates diversity. For assessment to support this process it too must adopt democratic principles. Where it becomes an activity solely undertaken by teachers and school managers and remains focused upon narrow academic outcomes it acts as a barrier to the inclusion agenda. For this reason Mary and Jayashree in their sessions today emphasised the need to place the pupils’ interpretation of their own learning at the centre of the assessment process and conveyed the message that we start from the strengths of the learner. Working in inclusive teams was emphasised and respect for families reinforced with consideration given to how assessment information is conveyed with empathy. Within very little time our students, many of whom work in schools with a “traditional” view of assessment were voicing their opinions and demonstrating their innovative ideas for how assessment might inform the development of inclusive teaching and learning. The means by which assessment might provide us within insights into the impact of the teaching environment and a shift of focus to provide a consideration of the assessment of teaching styles, were just two of the ideas keenly contested today. Arguments were plentiful and the debate fierce, but all in good humour and deftly refereed by tutors! The ideas emerging from the discussions and workshop activities of students today were highly original and creative. Now I think I understand, the reason everyone in this room seems cleverer than me, it’s simple really – they are! This entry was posted in Uncategorized and tagged assessment, democracy, Inclusion by Richard. Bookmark the permalink. Sunday’s atmospheric observations inspired the monkeys to take on a ‘magical realism’ in West Cork. Yesterday’s was very insightful as I am working on developing indicators for an inclusive early years project. Gaining hugely from Tim Loreman’s work and your interactions and observations. Today’s blog provokes thought about the inclusion of student assessment of teaching practices, or students’ ability to inform teachers as to which type of assessment suits their (students’) learning style better. Could parents join this forum and add to the democratic nature of education and assessment? Could they be represented less as users of assessment but more as contributors of valuable sources of assessment information on their children and how they learn and interact with society? Could knowledge be shaped not only by the world we live in, but by the world we want to live in? Should we allow ourselves ‘to be changed by ideas’…to ‘place oneself at risk’… to reinvent ourselves (hooks, 1994, p.3). Monkeys in West Cork – now there’s a thought! The students on the MA programme talk a lot about the role that parents play in education and certainly show an enthusiasm for change. Families have been kept a little at bay from some schools and some others they are seen only to have a part in supporting their children after school. However, we are now seeing examples of schools that value the contribution parents make to assessment and are forming positive partnerships with them. I am sure that the students on the course here in Bangalore will become leaders in developments of this nature. I’ve been following your blog on a daily basis, and have been motivated to read up more on Nate Gage’s work. How apt was his concept of ‘artistry in teaching’ – a far more creative and inspiring term than what we refer to as ‘differentiation’ today, in my humble view. I’d be interested to know your students’ perspective on the processes involved in enabling their pupils’ to develop interpretations of their own learning at the centre of the assessment process, particularly whilst transitioning from teacher- to more student-centred learning environments. My fondest regards to Jayashree, Mary and Johnson. Hi Saneeya, good to hear from you. Nate Gage was an inspiration to many teachers 25 years or more ago. Sadly his work is now largely ignored. His commitment to understanding what we can learn from our pupils and students was immense and certainly influences the way I teach. The transformation of the assessment process remains a challenge, but there are many teachers committed to this and with time the importance of a more holistic approach will find favour. Parents of course are viewed more as “fee payers” and a hinderance to the smooth functioning of the school … in most cases …so there’s a lot that can be debated upon.